The new WaterHub Docents Program trains students to offer guided tours of the groundbreaking water reclamation facility. Photo by David Fisher. It's been almost a year since the WaterHub, a water reclamation facility that is the first of its kind in the nation, officially opened at Emory. Now the innovative project is offering student-led tours to give visitors a first-hand view of how the facility works. 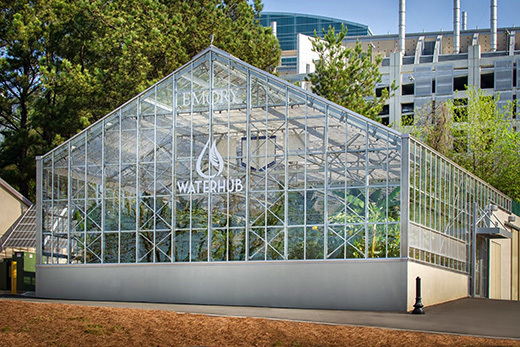 The WaterHub, which celebrated its grand opening in April 2015, collects wastewater — water flushed down toilets, showers and sinks on parts of the Emory and CDC campuses — and uses biomimicry, engineered systems that emulate natural processes, to reclaim up to 40 percent of Emory's total water usage per year. The reclaimed water is used for heating and cooling campus buildings and flushing toilets in certain residence halls. The award-winning facility continues to attract campus, local, national and international interest, with individuals and groups touring the facility almost every week. Emory's Office of Sustainability Initiatives (OSI) and Campus Services staff members have been leading these tours, but they saw an opportunity to connect students more directly to the educational purpose of the WaterHub. This spring, OSI and Campus Services launched the WaterHub Docents Program. The program identifies, trains and supports both undergraduate and graduate students to act as tour guides of the WaterHub facility for at least one academic semester. Once trained, the docents manage the whole process, from scheduling tour requests to ensuring that visitors receive the experience and information that they seek from a tour of the facility. "Students in the program have the unique opportunity to learn about the WaterHub and its importance, develop techniques for and comfort with presenting to visitors of all ages and interests, and connect with often-prestigious campus and community leaders," says Taylor Spicer, programs coordinator for OSI. Every Tuesday and Wednesday this semester, two enthusiastic students offer guided tours of the WaterHub to Emory students, faculty and staff; community members; and government officials. The docents are Norah Elmagraby, who recently completed her MSc in sustainability management from Columbia University and is a student in Emory's Laney Graduate School's PhD program in Islamic civilization studies, and Mary Anderson, a senior in Emory College studying international studies and Chinese. "It has been an honor to be a part of the positive changes on campus and teach about this catalyst to the Emory community and local, national and international groups," says Anderson, who is preparing for graduate studies in international sustainable development. Individuals and groups can join one of the two weekly tours by signing up on the WaterHub scheduling site. Students interested in applying to be future WaterHub docents can contact Taylor Spicer of OSI.